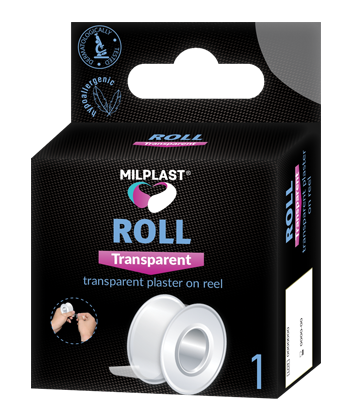 Plaster Milplast ROLL Transparent is specialy made for fixing bandages, catheters, probes, compresses, tampons. Due to the fact that the patch is released in the form of a cutting tape, it is easy to cut into pieces of the necessary length or use for the complete fixation of bandages.The material of the plaster is transparent, does not attract attention, and thanks to microperforation it can be easily and without any pain removed even from the areas of the body with hairy cover. Does not leave traces. Easily torn without scissors.